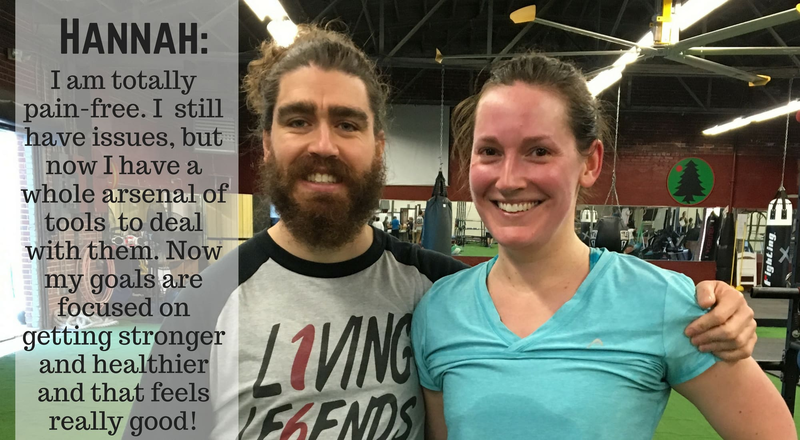 Sarah came to us in July with the desire to improve her body composition and get stronger so she could run longer distances without pain. 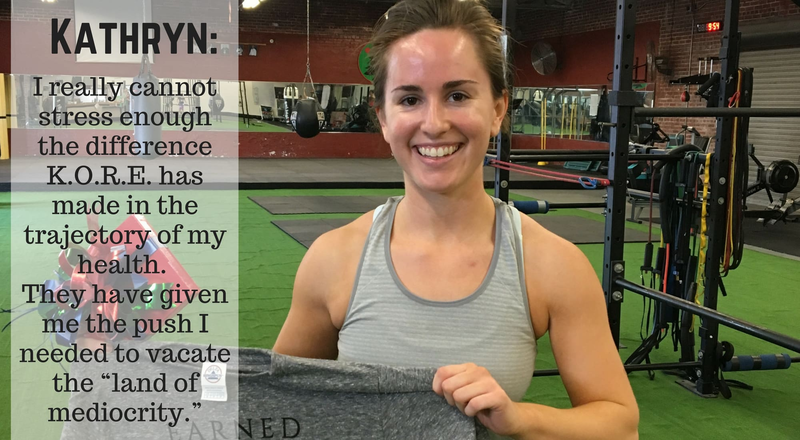 Since Sarah joined the KORE family, the entire staff has been impressed with her determination to improve her health and fitness. 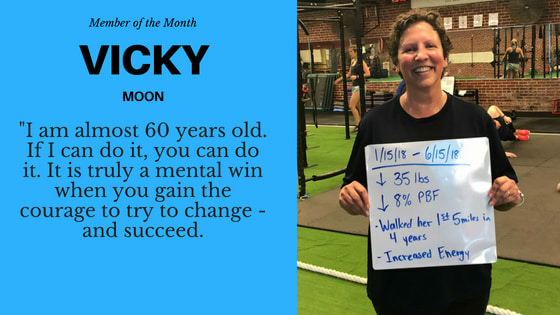 Her consistency and willingness to be patient with the process of improving her quality of movement to achieve higher levels of fitness has shown through in the huge strides she has made in her training programs. She’s doubled the amount of weight she can use in almost every exercise since July and she does it all with a smile on her face! In our coaching calls, Sarah has approached improving her health habits outside of her time at KORE with the same patience and determination. Even if she falls short of the goals she set for herself, she puts thought into an alternative solution and we approach her goal from a new angle in the next call. This mindset that she comes by naturally is one that we try to foster in all of our members! Her slow approach to consistently make small steps towards improving her health have her blocking out her training times on her calendar a week in advance, waking up early to go for runs on her non training days, trying out new recipes, and improving her average mile pace by 20 seconds! We can’t wait to see what other amazing things Sarah achieves as she continues towards her health and wellness goals. Want to find out more about Sarah’s journey from her own words? Check out her responses below! My good friend, Hannah Honeycutt, talks about Kore all the time. When I finally decided to make a change and start really working on fitness and getting healthier, I decided to reach out to Kore because she spoke so highly of them. I wanted to work on becoming stronger and healthier, but I was afraid to end up somewhere that might be too intense, or try to get me into difficult programs too quickly. And I am sometimes slow to change habits, so I needed a place that would be patient with me and let me grow on my own. Judging from what Hannah said about Kore and from what I read on Kore’s website, this seemed like it could be a good fit. I initially wanted to lose weight and build strength so that I could run faster and be less worried about injuring myself. Lack of knowledge about strength training. I’ve always been a cardio person, and I had no idea about mobility and making sure that my form was correct to avoid hurting myself when working out. And I really need structure and definable goals to exercise regularly, and that was something I was not doing on my own. It hasn’t changed really, but it’s evolved. I’ve been amazed at how much my body changed in a fairly short period of time. I’ve never had arm muscles before, and I do now, so that’s fun. That said, the actual weight loss part of my goal was a lot slower to get going. Probably because I was slow to embrace the fact that this would be a lifestyle change that would require more than just waking up early to work out a couple of days a week. 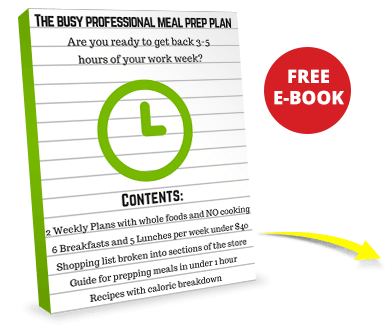 I’ve had to look at my meals and figure out how to eat better without being miserable about food. It turns out that took forever for me to do, and only recently have I felt like I’m getting the hang of it. So I still have the same goals, I’m just learning to be more patient with myself and keep at it. I just generally feel better, and I think that more than anything else has increased my confidence. As much as I dislike my alarm going off before the crack of dawn, once I get into my work out and start feeling good, it all becomes worth it. I’m also learning to not be so hard on myself and that sometimes I will mess up workout-wise or food-wise, but that’s ok. So I’m kind of less hard on myself now, which is nice. Better than before! Prior to starting at Kore, I was gaining weight and freaking out, because the older I get, the harder it is to get healthy. Now that I’m seeing results of hard work and eating better, I feel better about my chances of sticking with it and staying healthy. I’m also hopeful that the strength training and tips I’m learning at Kore will help keep me from injuring myself when I run so that I can keep it up in the future. I like the people, both the Kore staff and the other members. Everyone I’ve met just seems nice and not judgmental. That was a huge help for me when I was starting out and knew next to nothing about working out in a gym and felt really self-conscious. And it helps now, when I know I still have a lot to learn. And I can’t lie, the fact that it’s dog friendly sometimes (and I’m dog crazy) is a huge bonus. I love getting to pet some of the pups after joint mobility on Saturdays! Don’t rush yourself, and don’t freak out if you fall off your regimen at times. When I first started out, I sort of expected changes to happen quickly. Maybe for some people they do, but they didn’t for me. And that’s ok. I’m getting there, it just took some time for me to really find my groove. And if you’re trying for a big lifestyle change, falling of the healthy eating or working out wagon is going to happen. Sometimes I just want all the tailgate snacks, and other times I just don’t want to run when it’s freezing and dark out. That’s ok too! Just be easier on yourself, because I think people tend to be harder on themselves than anyone else.